ORAU provides crucial support to the Centers for Disease Control and Prevention (CDC) as it pursues increasing the HPV vaccination rate. CDC set a goal of 80% coverage by 2020, and ORAU is helping CDC achieve that goal through a national media campaign to promote the HPV vaccine to clinicians and parents of adolescents. The urgency stems from the emergence of 14 million new HPV (human papillomavirus) infections every year. Nearly 79 million people are infected with HPV. 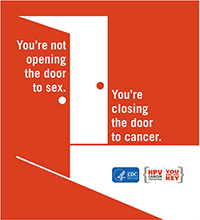 HPV infections are sexually transmitted and associated with several types of cancer in men and women. ORAU and its partner Mediassociates made extensive use of digital media advertisements on targeted websites and social media channels. The YouTube campaign has been extremely successful, driving nearly 914,000 video views and more than 40,000 hits to the HPV website of CDC’s National Center for Immunization and Respiratory Diseases (NCIRD). In addition, the media campaign in August 2013 used medical journal advertisements, radio and newspapers. In total, the campaign has yielded 153 million impressions and 137,000 clicks on advertisements to NCIRD’s HPV website. Overall, the campaign delivered more than 9.2M impressions. The campaign drove over 29k clicks to the site with a response rate of 0.32%. Pandora banner audio and web ads delivered strong response volume driving nearly 400 users to the site. Search Engine Marketing drove 3,647 clicks to the HPV site and garnered more than 265K impressions. The ORAU team recruited gynecologists and gynecological oncologists to speak to family physicians and pediatricians at chapter meetings of the American Academy of Pediatrics (AAP), immunization conferences, and local hospital grand rounds. Support was provided to CDC to sponsor booths at the 2013 and 2014 national conferences of AAP and American Academy of Family Physicians. Describe the burden of HPV infection and related diseases, as well as the Advisory Committee on Immunization Practices (ACIP) recommendations for HPV vaccination of adolescents. Discuss HPV vaccination with parents and provide a strong recommendation for same-day receipt of HPV vaccination. To promote vaccination rates and emphasize cancer prevention, ORAU and CDC teams developed HPV educational messages. The HPV vaccine is recommended for preteens 11 and 12 years of age and young men and women 13 to 26 years of age who have not yet been vaccinated. Infections are most common among adolescents and young adults. The rates at which females are being vaccinated are stagnant compared to other adolescent vaccines, and rates are even lower among males. To understand the underlying reasons, the ORAU team conducted research through focus groups with parents of adolescent boys and girls and in-depth interviews with health care workers. The ORAU team collected data on knowledge, attitudes and beliefs about the HPV vaccine held by these individuals. Based on the findings from the focus groups, ORAU and CDC teams created new messages and materials specific for these audiences.